The Winograd Report has focused on why the Second Lebanon War failed-- but understanding why the war failed is less important than understanding why the war began. From its birth, the State of Israel had gradually expanded its territories, pushing back its enemies, increasing its frontiers and building new towns and villages to hold them. And then in the last decade and a half, Israel began to shrink. While Israel's population may have grown, the Land of Israel has been reduced, carved up, given away and tossed aside. The State of Israel born with a vision of returning to the land has traded away that land in exchange for treaties with its enemies and the promise of a New Middle East built on economic cooperation that has never materialized outside the realm of Shimon Peres' speeches. 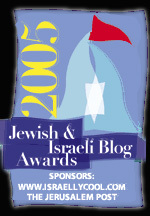 In a Jerusalem Post column, M.J. Rosenberg, Director of the Israel Policy Forum's Washington Center writes, "The invocation of the worst years in the history of the Jewish people as analogous to today's situation seems particularly absurd when you are walking along the seafront promenade in Tel Aviv." He goes on to say that Tel Aviv is, "the place in Israel that is most antithetical to the Zionism of the settlers who choose to live not in an Israeli city, town, village or kibbutz but as a tiny minority among a Palestinian population hostile to its presence... The good news is that less than 5% of the Jewish population of Israel has chosen to abandon life in Israel for life on a hostile frontier." If you wish to understand the mentality and mindset of a political class that has embraced withdrawal as a means of achieving security for Israel-- no other words are needed but these. They are the words of a political class that walks the promenade of Tel Aviv, sits in its cafes, watches the sun set and watches its overseas bank accounts and IPO's much more closely. A political class that believes urban life somehow insulates it from the realities of life. Rockets have shelled Haifa, but so far they have not shelled Tel Aviv and until they do-- war seems unreal and far away. Magical thinking allows you to believe that you can protect yourself from harm by drawing a line between you and danger and withdraw behind it. Withdrawing from harm is a natural childhood instinct, to run away from what threatens us by going to a "safe place". For a child that safe place might be a magical kingdom. For an adult it can be the nightclubs and beaches of Tel Aviv, the lifestyle of an urban city that is permeated with a sense of unreality. An adult's magical kingdom to sate an adult's desires. But while the urban elites drench themselves in escapist hedonism, the frontier withers. There are no safe places in the real world. For two thousand years the Jews ran, from east to west and west to east. From Christian nations to Muslim ones and from Muslim nations to Christian nations and back again. Those who were lucky ran. The unlucky ones died, hacked to pieces, burned at the stake, beaten and beheaded, hung and pierced with swords, forcibly converted to foreign faiths, persecuted until they were assimilated and perished. After two thousand years, the Jews returned to their own land to make their stand. Under equipped forces of militia with used Czech weapons faced down the armies of five Arab nations, including the British trained Jordanian legion and held their own and won. And then did it again and again. The price was heavy enough to break the heart but the point had been made. The Jewish people could live free from persecution in their own land-- if they were willing to fight for it. With the Peace Process, Israel instead embraced withdrawal. Politicians preached that running away would bring us to a "safe place" in the "New Middle East" that would surely form once we gave our enemies almost everything they wanted. Israel retreated further and further back and the enemy advanced. It advanced into the roads and towns along the frontier and into Jerusalem and Tel Aviv and Haifa too. Rockets fell, buses exploded and cafes were torn apart with the blasts of suicide bombers. At each stage of withdrawal, there was ample warning that withdrawal had already failed. There was no "safe place" that could be created by retreating further back and magical lines on maps do not protect you from harm. The Second Lebanon War was brought about not by Olmert, but by Ehud Barak who believed that Israel could give up its security zone in Lebanon and still somehow be safe. The first installment of the price of that withdrawal came in the Second Lebanon War when Hizbullah used the border to attack Israel and shell Israeli towns and cities all the way into Haifa. So too the ongoing shelling of Israeli towns from Gaza is the product of the withdrawal from Gaza. Both of these are only a corollary to the staged withdrawals that created the Palestinian state. Retreat in the face of an enemy advances his position and reduces your own. Israel's limited territory insured that the retreats of the last decade and a half have put Israel's cities back on the firing line. By neglecting and dismantling the frontier, the way is opened to the cities that the frontier is meant to guard. Israel's urban elites in Haifa and Tel Aviv who clamored against the settlements and against Israel's Security Zone in Lebanon are finding that they are now the frontier. In 1948 the frontier was not in Hebron, but at Tel Aviv where the Egyptian Army stood poised to invade the city. 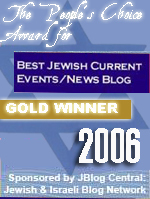 Israel pushed back the enemy at great price and secured and expanded its territory. Settlements and army bases went up to hold the frontier and protect the nation and the residents of Tel Aviv and Haifa-- until in their arrogance the urban elites of those cities foolishly declared that the problem was in the frontier. If only we could pull back from the frontier, there would be peace. Israel has pulled back from the frontier and now the frontier approaches Tel Aviv's promenades again. From the frontier to the promenades of Tel Aviv, security is never achieved by withdrawal and in the aftermath of withdrawal-- inevitably follows war. It's amazing that left wingers still believe that they'll actually achieve peace by sacrificing the frontier. If (G-d forbid) the settlements are lost, does anyone really believe the enemy will stop there? It'll be Tel Aviv and Haifa next. The illusion of safety will evaporate. And you're right. It is magical thinking. The settlers are the canaries in the coal mines.